“You don’t seem that short,” people often tell author Seth Ulinski. At 5’7″, Seth is three inches below average height. 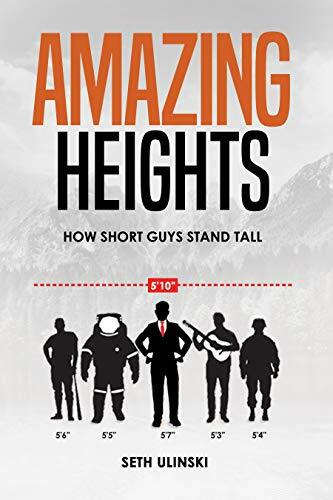 In the introduction to his book Amazing Heights: How Short Guys Stand Tall, he jokes that perhaps he could chalk it up to “really” being 5’7″ and a half. But it’s more than that: an attitude. A posture. A frame of mind. And his book serves as a guide for the estimated 60 million other men in the “short guy fraternity” to gain the same confidence. “I decided to write the book after I noted that there were limited resources addressing the unique challenges of the not-so-tall,” Seth said. The book “examines society’s height bias and provides ways for readers to build their presence,” including how to shop for height-maximizing clothes, career tips, and advice on dating. As he was writing the book, Seth tested his concept with his Facebook network. He got decent guidance, he said, but the feedback was limited. Then, Seth listened to the Authority Self-publishing podcast, where he learned about PickFu. He created three different PickFu polls, each with an audience of 50 males, to gauge reaction to different titles and subtitles he had been considering. “Initially I was expecting a simple tally of votes to determine whether Concept A or Concept B was best, and perhaps a few notes on why folks made their selection,” he said. But what he got proved much more valuable. With confidence in his title, Seth launched his book. Sales began coming in, but Seth believed he could do better. So a few months after the initial launch, he decided to take a fresh look at his cover design. Armed with this new information, Seth relaunched the book with the revised cover design. “The uptick in sales has been noticeable,” he said. He now sees consistent daily sales. If you’ve got a book in the works, join the thousands of authors who have used PickFu to test titles, subtitles, cover designs, blurbs, and author bios. Get insights from hundreds of readers in minutes. Try it now!